Activists built support for the ordinance by demonstrating that it would reduce poverty in the city. Yesterday, June 2, the Seattle City Council approved a new ordinance that will raise the minimum wage in the city to $15 per hour—the highest in the United States. Seattle’s economy is fueled by high-tech industries and cutting-edge products produced by some the most famous corporate names in the nation: Starbucks, Amazon, Microsoft, and Boeing. But the cost of living in the city is high and rising. People who work in low-wage nonprofessional jobs here—restaurant workers for example—find it increasingly difficult to afford the rising cost of food and housing in the city. As is true across the United States, many low-wage workers have to supplement their full-time salaries with government assistance like food stamps in order to have both rent and groceries. Momentum for the new minimum wage ordinance began in SeaTac, Wash., a small blue-collar city south of Seattle that is home to the region’s major airport. In November 2013, voters in SeaTac approved a ballot initiative raising the minimum wage for airport workers to $15 an hour. The voters’ approval of Ballot Initiative 1, put forward by Yes for SeaTac, a union-backed organization, encouraged the minimum wage movement in Seattle. So did the campaign for Seattle City Council of Kshama Sawant, a socialist who ran on the promise to work for a $15 minimum wage. The energy behind her campaign pulled in mayoral candidate Ed Murray, who was also elected in November after promising to support raising the minimum wage. One of Mayor Ed Murray’s first acts in office was to convene an “Income Inequality Advisory Committee” of representatives from business, labor, and community groups, charged with delivering a plan for raising the minimum wage in Seattle. The final draft of the ordinance they negotiated makes some concessions to business interests, including a phase-in of the $15 minimum wage. Businesses with more than 500 employees will be required to pay workers $11 per hour by April 2015, rising in increments to $15 by 2017. Larger businesses that provide health care for employees will be required to pay $15 per hour by 2018. But despite the phase-in and several exceptions to a blanket minimum wage, less than a year after her election, Sawant declared the city’s new minimum wage ordinance a victory. If so, it is a victory shared by all who pushed for it. Most visible were young activists in their twenties and thirties who moved directly from Sawant’s campaign to a new group, “15 Now.” They held marches and demonstrated in front of fast food restaurants throughout the winter and early spring. Their demands for a $15 minimum were reported extensively by local news, including network TV affiliates. The Stranger, a Seattle alternative weekly paper, covered the campaign in its usual lively and irreverent style, and provided a forum for citizens—from low-income workers to millionaires—to voice opinion and debate the merits of raising the minimum wage. By the time Mayor Murray and the group Local Progress hosted an income inequality symposium at the end of March, it appeared that a $15 minimum wage for Seattle was an idea whose time had come. 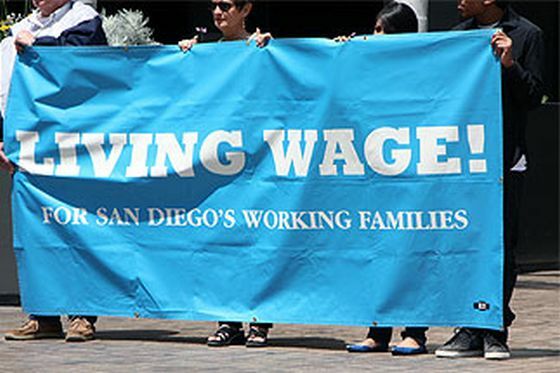 City councilmembers from San Jose, San Diego, Chicago, and New York City spoke at the symposium about the struggles of low-income people and the need to raise the minimum wage in their communities. Economists were on hand to share data about the need for a new mandatory minimum—some figured a real living wage in Seattle to be as high as $25 per hour (e.g., for a single parent with one child). Several studies were presented demonstrating that raising the minimum wage would have positive effects for Seattle’s economy in giving workers more money to spend on goods and services in the city. Researchers from the West Coast Poverty Center at the University of Washington presented findings showing that an increase to a $15 minimum would help reduce poverty in Seattle, where a third of residents earn less than that. Reducing poverty was the bottom line for the activists, experts, and local officials who had traveled to Seattle to attend the symposium. In her closing remarks, Felicia Wong of New York’s Roosevelt Institute evoked the success of the New Deal in alleviating poverty and correcting the Great Depression of the 1930s.